Former Boston Red Sox ace Curt Schilling may be a little less of a hometown hero after announcing that his 38 Studios venture is taking the money and running to Rhode Island. Schilling won 216 games and struck out over 3100 batters during a 20-year career but his legend was built during his four-year stint with Boston that saw him win two World Series rings, most notably in 2004 when he pitched in a dominant fashion despite suffering from an injured, bleeding ankle. In 2006, he launched 38 Studios (originally known as Green Monster Games), which is currently working with Todd MacFarlane and R.A. Salvatore on the single-player RPG Kingdoms of Amalur: Reckoning and an MMOG project called Copernicus. But Schilling's loyalty to Boston apparently has a price: $75 million, to be exact, which is the amount the state of Rhode Island offered in loan guarantees if the studio would pull up stakes. A government representative said Massachusetts did attempt to convince the company to stay but wasn't willing to become involved in a "bidding war" and thus Schilling, who first started dropping hints about relocating in March, confirmed yesterday that the studio is moving. "I've invested a significant amount of my life's earnings in 38 Studios, and I will protect the loan guarantee that's been given by the state with the same passion and interest that I'm protecting my own investment in this company," Schilling told the Boston Globe. "Our paths are very much aligned." Not everyone is thrilled with Schilling's decision. Demiurge Studios CEO William Reed wrote an open letter to Schilling urging him to "reconsider" the move, while studio director Albert Reed told Gamasutra the decision was "shocking" and could actually have a negative effect on the company in the long run. "This is the town that brought you Guitar Hero, Rock Band, BioShock and Asheron's Call. 2K has a studio here [Rockstar New England] that did a bunch of work on Red Dead Redemption. And it's not a bunch of disparate companies that don't talk to each other. There's very much a community here," Reed said. He acknowledged that $75 million is a "big chunk of change" but added that being in the midst of an established development community is very valuable as well. "It's so helpful professionally... There's just so much here," he said. "It's shocking to me that anybody would pick up their company and move it to another location that doesn't... already have a talent pool." The size of the Rhode Island loan guarantee is a bit shocking too. 38 Studios boasts some high-profile names but hasn't actually released any games yet, and even Governor Don Carcieri admitted it was a "risk," albeit it one he claimed was "worth taking." "We need to make a statement," Carcieri said. "This gives us the ability to be a real player in the digital-media area." 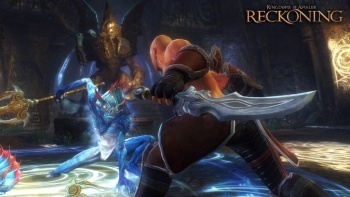 Kingdoms of Amalur: Reckoning is slated to come out in fall 2011, while Copernicus has no release target.